In a trick reminiscent of the miracle of the loaves and fishes, my paternal grandmother was able to stretch one measly anorexic chicken into a satisfying meal for the hungry multitudes frequently seated around her well-worn dining room table. To create a first course of traditional Greek egg-lemon soup, the chicken was boiled for hours until even the poor little bones were gelatinous. Then, in a clever effort to simulate Greek style lemon roasted chicken, Yiayia dredged the boiled chicken remnants from the broth, buried them beneath a copious concoction of lemon, oregano and salt and cooked them all over again in the oven. 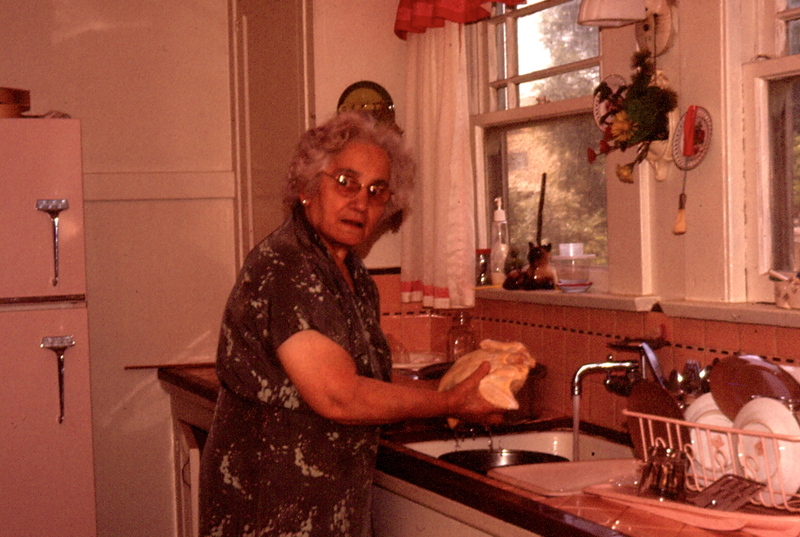 In the event that a whole chicken wasn’t at hand or if she was feeling particularly frugal, Yiayia would create the same meal using only chicken necks and backs. In those days, separately packaged at about 29 cents a pound, those necks and backs made frequent appearances in our meals, sometimes several nauseating days a week. One day when the usual family horde was expected for dinner, my cousin Cathy and I put our heads together in our corner of the coop (the nursery bedroom where we slept) and clucked out a plan for a chicken neck intervention. We decided to make stifado, a rich stew of beef, onions and tomatoes, heady with the flavors of cinnamon and cloves. Neither of us had attempted such an ambitious meal, but we were stubbornly determined not to eat chicken anything ever again, and were most certainly dreaming of the praises that the grateful family would heap upon our swelled heads. We were young and inexperienced cooks. The day had not yet come when we would fearlessly tweak recipes, tossing aside our measuring cups and spoons, confidently throwing in random fistfuls of this and that and still turning out perfectly edible meals. Afraid of improvisation, we religiously followed the recipe in an old Greek cookbook, and got the stew simmering in a huge pot on my grandmother’s great big beautiful old stove. With nothing left to do but watch the pot, Cathy and I decided to make a run to the grocery store for a forgotten item. Full of ourselves, we left the house, admonishing our grandmother to keep an eye on our precious stew. We soon returned with our purchases and ran straight into the kitchen to check on the stifado, which was still quietly bubbling. We tasted it for the umpteenth time and as soon as we proudly pronounced it “perfectly delicious,” my grandmother cheerfully confessed that, while we were away she had added to it a substantial amount of ketchup. Ketchup! Ruined! Our stew was ruined! Flapping and squawking, we chased our deflated grandmother out of her own kitchen, and spent the rest of the afternoon wondering how we would serve the abominable meal to our disappointed family. Now, when I occasionally wander aimlessly from room to room trying to remember where I put something, maybe the ketchup, I have a sneaking suspicion that when my sweet grandmother died, she took with her the piece of my mind that I so carelessly gave her that long ago day. Not sure where you have found all these pictures that you use, but this one is priceless. She was certasinly not the greatest cook, but the few things she made were delicious. I miss her very much. Susie, growing up we never had chicken outside of a cx pot pie which was frozen. Every chance I get one of those oven roasted birds from Costco comes home with me. We devour it until we’re bored & then it becomes soup stock. Makes me feel very domestic. Loved your grandmother-she was so gentle, and sweet. What memories! I was never again able to use ketchup in a recipe without thinking of Yiayia’s ketchup intervention! Sweet Yiayia! I hardly remember her when she was so robust. How old was she in that picture Suzy. I remember the chicken but my strongest memories are of the Campbell Tomato Soup and grilled cheese sandwiches for lunch. Oh, and remember that pink refrigerator? For some reason I always remember lamb chops, salad and watermelon. And Oreos. And Fig Newtons.